THE UK HAS banned the flying of any Boeing 737 MAX aircraft in its airspace, following the deadly Ethiopian plane crash at the weekend which killed 157 people. The Ethiopian Airlines Boeing 737 MAX 8 went down minutes into a flight to Nairobi in Kenya on Sunday, killing all 157 people on board, months after a Lion Air jet of the same model crashed in Indonesia killing 189. One of those killed was 39-year-old Michael Ryan, who was Deputy Chief Engineer at the United Nations’ World Food Programme. This afternoon, the UK Civil Aviation Authority has issued instructions to stop any Boeing 737 MAX passenger flights from any operator arriving, departing or overflying UK airspace. “Our thoughts go out to everyone affected by the tragic incident in Ethiopia on Sunday,” it said in a statement. The UK Civil Aviation Authority has been closely monitoring the situation. However, as we do not currently have sufficient information from the flight data recorder we have, as a precautionary measure, issued instructions to stop any commercial passenger flights from any operator arriving, departing or overflying UK airspace. This directive will remain in place until further notice. The move comes as airlines around the world remove the model from their schedules, while US regulators have ordered Boeing to make urgent improvements to the jet. Ethiopian Airlines said investigators had found the plane’s flight data and cockpit voice recorders yesterday. It said it had grounded its fleet of six remaining Boeing 737 MAX 8 planes pending analysis of the black box data. “We assume we will find out the cause of the crash in the black box data,” the airline said. Australia, Singapore and Malaysia also banned the model from its airspace today. Norwegian has confirmed that it is temporarily suspending its fleet of Boeing 737 MAX. “We will do our utmost to take care of our passengers in the best possible way,” it said. The Civil Aviation Authority of Singapore (CAAS) said in a statement it was “temporarily suspending operation of all variants of the Boeing 737 MAX aircraft into and out of Singapore in light of two fatal accidents involving Boeing 737 MAX aircraft in less than five months”. The US Federal Aviation Administration (FAA) yesterday ordered Boeing to improve anti-stalling software and the model’s maneuvering system, giving the company until the end of April to make the updates. However, it ruled out grounding the fleet for now. Airlines in Ethiopia, China, South Africa, Indonesia and the Cayman Islands said yesterday they were suspending operations by their 737 MAX 8 fleets. China also ordered domestic airlines to suspend commercial operation of the MAX 8. Indonesia, which has 11 of the MAX 8 model planes, said it would “carry out inspections and temporarily prohibit Boeing 737 Max 8 from flying”. South Korea ordered an inspection of two MAX 8 planes flown by low-cost Eastar Jet. Some other airlines said they were not cancelling MAX 8 flights, including Oman Air, flydubai, Turkish Airlines and Russia’s S7. Fianna Fáil transport spokesperson Robert Troy has called on the Irish Aviation Authority (IAA) to “immediately suspend Boeing 737 Max 8 aircraft from use of Irish Airspace and withdraw the certificate of air worthiness from all Irish registered Boeing 737 Max 8 until such a time as their safety is clarified”. “This is the second deadly incident involving this model of jet in less than five months. Passengers are understandably frightened and aviation experts are trying to ascertain how this has happened,” Troy said. The plane that crashed on Sunday was less than four months old. Ethiopian Airlines said it was delivered on 15 November. 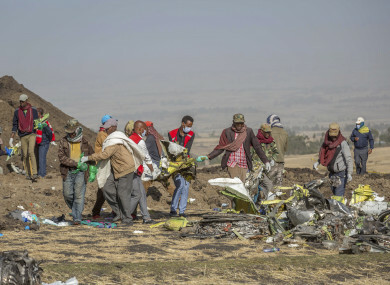 The jet went down near the village of Tulu Fara, some 60 kilometres east of Addis Ababa. The IAA has been contacted for comment. Email “UK bans all Boeing 737 MAX aircraft from its airspace following Ethiopia Airlines crash”. Feedback on “UK bans all Boeing 737 MAX aircraft from its airspace following Ethiopia Airlines crash”.